The ‘bucket list’ trip of a lifetime. 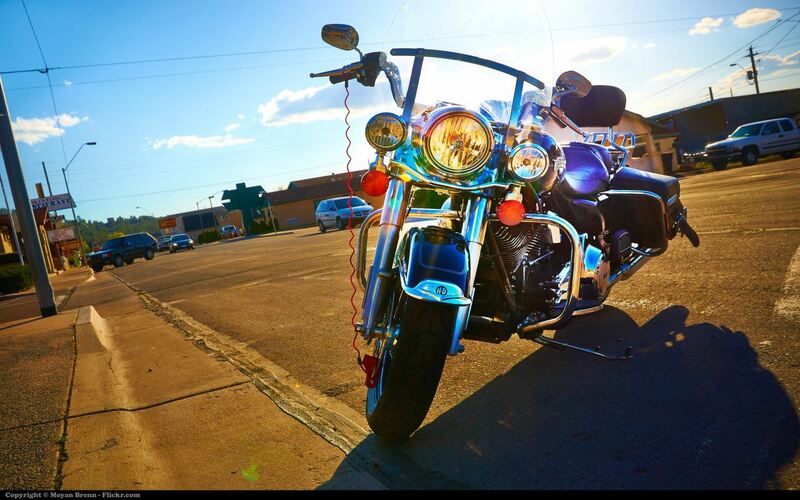 Inspired by old movies, classic American literature, and legendary stories, this journey allows you to enjoy the sights and stunning scenery of America’s heartland on a self-driven Harley Davidson motorcycle. Much of the iconic road is now an American Scenic Byway and you’ll understand why when we roll through miles of open scenery, eat at old-school diners and stay in quirky western towns oozing with character. 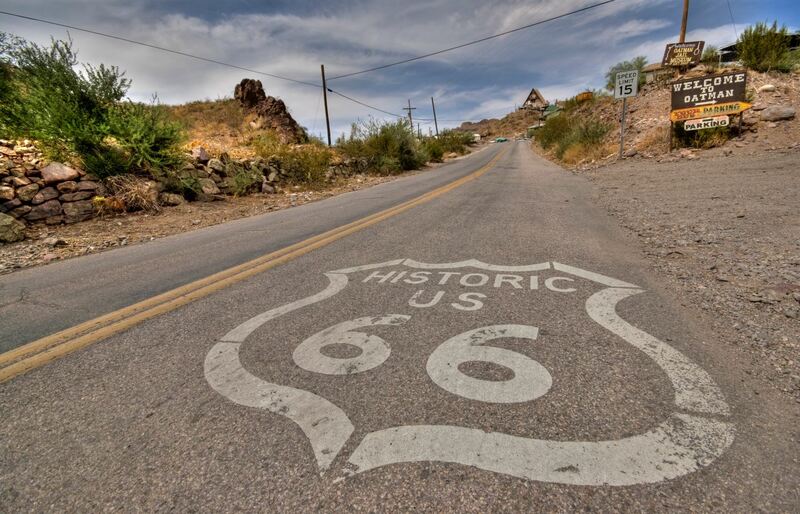 The once neglected route has been steadily restored and revitalized to preserve the historic charm and we have crafted the perfect nostalgic adventure for you to get your kicks on Route 66! We meet after lunchtime at the hotel and talk about our upcoming adventure on the Mother Road of America, Route 66. In the afternoon, we’ll conduct an orientation with the bikes to familiarize ourselves with the upcoming adventure and our Harley Davidsons. Afterward, we check out the beginning of Route 66 in downtown Chicago and head out for a hearty Chicago dinner to discuss our big adventure! Time to get on your bike and ride! After breakfast, we settle into our bikes and head west for California. This is our first day on the road. See icons such as the ‘Gemini Giant’, ‘Rocket Man’, ‘Old Log Cabin’, and the old ‘Marathon Oil Station’. There’ll be plenty of breaks and photo opportunities along the way. We also stop at a Route 66 Museum in Pontiac to learn about Route 66 and the people who made America great. That afternoon we arrive into Springfield on our Harley Davidsons and stay at a nice local hotel in historic downtown where we can have dinner at a local restaurant and celebrate our first night on the road. We cross our first state line on Route 66 and head towards St. Louis. The Gateway Arch welcomes travelers heading East or West. The famous Budweiser Brewery. Maybe a blues bar tonight? Before we get to Saint Louis, we ride our Harley-Davidson motorcycles onto an old section of Route 66 that is all red bricks. Then to the historic Chain of Rocks Bridge. We will walk out on the old bridge over the mighty Mississippi River. Share your stories over dinner and prepare for your next day’s adventure. Riding our motorcycles on Route 66 through neat little towns, now we will have really fallen into sync with our Harley Davidsons. We could have some great authentic BBQ for lunch, and see the World’s Largest Rocking Chair. We get to see the real America that is still here, far far away from the big cities and enjoy the rolling Missouri hills that make this trail so fun to ride! Then we ride down a deserted twisty old part of Route 66 on our motorcycles to Devil’s Elbow. This is a great section of RT 66 filled with Googie Architecture. These are the fabulous classic photo spots with buildings and signs inspired by jets, cars and the Atomic Age! A really great motorcycle ride on the old pavement of the Mother Road. Gary’s Gay Parita and the old Route 66 Rainbow Bridge are some highlights. We visit some great old diners to fuel ourselves with pie and milkshakes for our next stretch of open road. The Elk City Route 66 museum is our stop for today as we edge towards Texas. Traversing old cattle trails of the Great Plains, this is the wide open road America is famous for. Entering the panhandle, do you ever get the feeling that everything is bigger in Texas?! Known as ‘The Yellow Rose of Texas’, Amarillo is bang central in the middle of the Texan panhandle. The roads here will make you think of what it was like to travel across the country in decades past. After covering many miles over the last few days, you will have surely worked up your appetite for a classic Texan Steakhouse dinner tonight! Just as we leave Amarillo, our first early stop is the amazing Cadillac Ranch – a Route 66 icon! Many rumors circulated about this eccentric art installation, and the changing look over the years (as you’re actively encouraged to help spray paint them!) 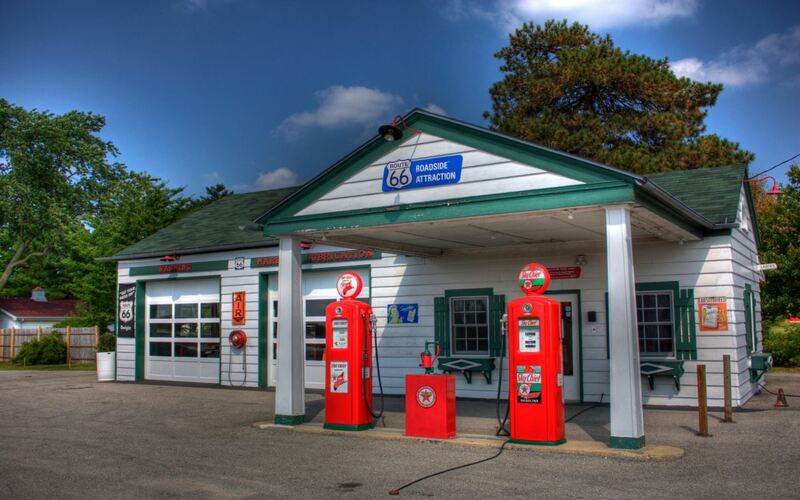 makes it one of our favorite sights on Route 66. As we reach our mid-point of the tour, we cross over another state border into Mew Mexico and welcome to Santa Fe. This is a beautiful, historic Southwest city with a fantastic blend of culture, art galleries, cuisine, and sight-seeing. 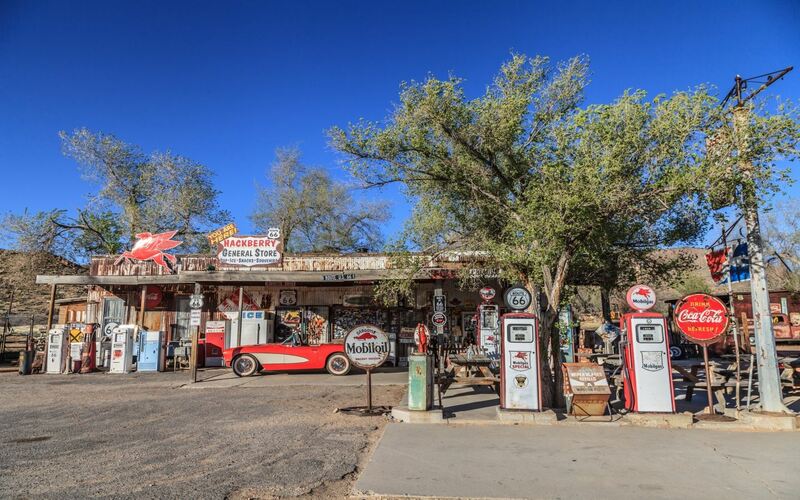 We’ll spend some time here so you can soak up all the charm and marvel at how the scenery and culture have changed yet again on your Route 66 tour! We start the day riding the curvy hills to Maggie’s Diner where the big showdown was in “Wild Hogs”. We reach Albuquerque in time to stop for lunch. Next, we follow the Route 66 path, and end at the little town of Gallup, at El Rancho Hotel. The historic El Rancho Hotel and Motel has hosted a numerous array of movie stars including John Wayne, Ronald Reagan, Humphrey Bogart, Katharine Hepburn, Joan Crawford, Doris Day, and Burt Lancaster. The rugged terrain surrounding Gallup was popular with Hollywood film makers during the 1940′s and 1950′s for the on-location shooting of Westerns so the entire cast and crew would stay at the hotel during filming. 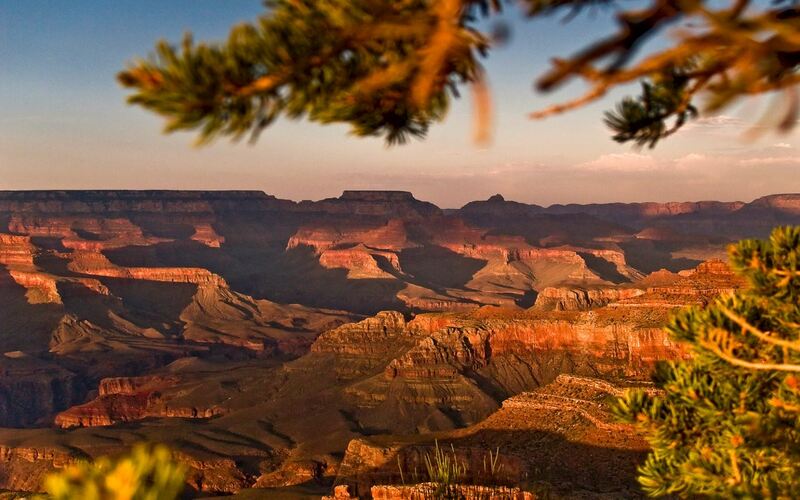 We spend almost a full day at Grand Canyon National Park so you can choose your activity for the day. A helicopter ride, hike, view the Watchtower or just sit, relax and enjoy the scenery and dream of your next adventure. We’ll make our way to Williams, AZ for dinner in this quaint little sleepy town. Now you’ll really feel you’re in the Wild Wild West! We will be in the forgotten Route 66 a lot of the day, driving through Grand Canyon Caverns, Peach Springs, Kingman…Towards the end of the day, we will work our way on an incredibly slow winding road to the old mining town of Oatman. Wild burros, real old 49er gold miners with real Colt 45s on their hips to protect their gold. Not much has changed here the past 100 years. It is almost unbelievable that this winding mountain road was the main East West road until 1953 when Route 66 was re routed. Time has held still since then in Oatman. Laughlin is a little gambling town on the way to Vegas on the Colorado River. A bit of practice tonight will get you ready for the Big Time tomorrow. An early morning ride out beats the heat, and we head to Las Vegas. En route, we’ll stop at the Hoover Dam and see the newly constructed Mike O’Callaghan – Pat Tillman Memorial Bridge connecting Arizona and Nevada. The 2,000-foot long bridge crosses Black Canyon just south of the dam, 900 feet above the Colorado River. We’ll approach the bright lights of Vegas, looking nothing like the small-town Americana we’ve enjoyed over the last two weeks and know that the pace is about to temporarily change. Explore the mega-casinos, hotels, gourmet restaurants, shows, and sights and remember, what happens in Vegas, stays in Vegas!! We take a little R66 excursion up into the amazing San Bernadino mountains. A last long hard ride through the desert, we are covered in desert dust. Our bikes are covered in road grime. They and we look and feel like we really did something. We’re nearing the end of our journey. Then a climb up into the twisty mountains brings us to an awaiting pool in the cool alpine town of Big Bear Lake. It is not over yet! We ride the Rim of The World. An incredible ride on the top of a mountain range, with the clouds below. One of our most amazing rides. Then we drop into LA, freeways, civilization. We make it through all the way to the end of Route 66. We arrive at the famous Santa Monica Pier and invite you to keep the Ride Free tradition alive of ending the tour by planting our feet into the cold Pacific Ocean! We turn the bikes in at the end of the day and celebrate completing one of the world’s greatest road trips with a Farewell Dinner tonight! We say our goodbyes and plan for our next adventure. There is so much more to see in the USA in the future. A shuttle will take you to the LAX. Prices are subject to change depending on availability.